It looks as if it has not been hung up. There are no pin holes, dirt or markings on this banner. The banner is made by Winning Streak. It is a genuine wool blend banner. This 15" x 10 1/2" flag is a 1-sided Applique and Embroidered(sewn) flag. Our premium quality flag is made of weather-resistant 420 denier heavyweight nylon and is perfect for hanging in a window or hanging outside. Single sided (reverse image shows on back). X 12.5" Team Logoed Garden Flag Banner! · Flag has reinforced pole sleeve for sliding it onto any standard garden flag pole. · 2 SIDED! Made for outdoor use! · BEAUTIFUL colors and graphics. 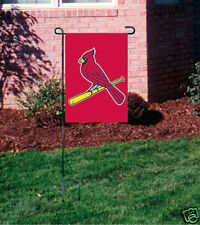 St Louis Cardinals "STL" MLB Flag. 3'x5' banner flag printed with team logo in vibrant colors. 100% Polyester. One sided team graphics (shows through on opposite side). 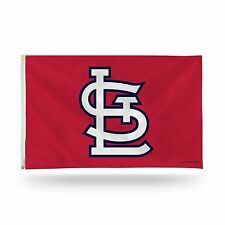 St Louis Cardinals MLB Flag. 3'x5' banner flag printed with team logo in vibrant colors. 100% Polyester. One sided team graphics (shows through on opposite side). St Louis Cardinals MLB Team Logo Indoor/Outdoor Door Banner 24" x 84"
St Louis Cardinals Cooperstown MLB Flag. 3'x5' banner flag printed with team logo in vibrant colors. 100% Polyester. One sided team graphics (shows through on opposite side). ST LOUIS CARDINALS. GENUINE WOOL BLEND DECOR. SIZE 8" X 32". READY TO HANG. St Louis Cardinals Banner 3x5 Ft Flag World Series Man Cave Decor Baseball MLB. Condition is Used. Shipped with USPS First Class Package. St. Louis Cardinals XL Great Sewn Letter Pullover Shirt by Banner Supply Co.
Great sewn Letter shirt. No holes or stains. Adult size. Measurements are: pit to pit- 23 inches, top to bottom- 27 inches. Is a faded red color, made that way. Very unique and perfect for the Cardinal fan. Saint Louis Cardinals MLB Dynasty Banner. Banner made of 70% Wool, 30% Acrylic. BUSCH STADIUM BANNER- Full Size Wool Banners. 20"x15" Busch Stadium Banner. Official Logos and Official Team Colors. Hang them from the ceiling or on the wall. Top-Quality construction with stitched logos and lettering. great look and feel. SCREEN PRINTED VISIABLE BOTH SIDES (OPPOSITE SIDE IS A REVERSE IMAGE). St. Louis Cardinals Busch Stadium Street Banner 52”x20” Scarce! Made of Wool Felt Material with Embroidered Team Details. Includes Sleeve and Dowel Rod for Hanging. This wall banner is made of genuine wool, and features high quality embroidery and appliqué. 24"x36" Wool Dynasty Banner. 24" W x 36"L. hang it from the ceiling, on the wall, or at your tailgate party. Mouse Pad 7.75”x9.25”x1/4” Colorful, durable cloth surface - Natural. St Louis Cardinals Felt Pennant Banner. Makes a great gift for any St Louis Cardinals Fan! This pennant is design to not crease when rolled it. Banner made of 70% Wool, 30% Acrylic. Jersey shaped wool banner featuring the establishing date of the team with replica-styled jersey decoration. This banner is inspired by the jerseys the players wear on the field. Constructed of wool fabric with embroidery and applique design detail. Baby Products. Constructed of heavy wool fabric with embroidery and applique design detail. These hanging wool banners display the evolution of your favorite sports team's logo. Natural Looking Floral Decor. Heading is on the left side of the flag. Image is one sided. SAVE WHEN YOU BUY MORE! Buy 2 FLAGS, get 5% off. Buy 3 FLAGS, get 10% off. Buy 4 or more FLAGS and get 15% off of your order. From the Cooperstown Collection by Winning Streak Sports. St Louis Cardinals Logo History Banner. 70% Wool 30% Acrylic. 3 RINGS ALONG TOP EDGE PROVIDED FOR HANGING BANNER. 20"x15" Busch Stadium Banner. ST LOUIS CARDINALS BANNER COLLECTION- Full Size Wool Banners. Official Logos and Official Team Colors. Top-qualityWOOL, high quality EMBROIDERY and APPLIQUE collectible. Banner made of 70% Wool, 30% Acrylic. Includes hanging rod and cord. Celebrate a legendary MLB franchise in retro "Roaring '20s" style! Note: this design is now out-of-print; last one available! Size: 17" x 26" Indented-Bottom Banner. Durable "Roll-it-and-Go" Felt Fabric. Made of Wool Felt Material with Embroidered Team Details. It is a 2-Sided embroidered flag, (not printed). Use indoors or outdoors. ( pole not included ).